Seven years after the release of In the Night, Dream Evil has returned with Six. The band says they were never on hiatus, just busy with other projects. Regardless of the why and how long, Dream Evil hasn’t lost a step in the past seven years. Six is the same brand of melodic heavy metal and power metal with great production and ’80s influence that Dream Evil has always had. The band has been criticized by metal snobs for not having sophisticated lyrics and the music coming off as a cheesy and goofy, but that’s kind of the point. The band isn’t a comedy act like Steel Panther, but they aren’t trying to be a dark, serious brooding metal outfit either. Dream Evil has always fully embraced the influence of ’80s metal (they’re named after a Dio album after all) and they’ve done it with enough respect and credibility that they don’t come off as a parody. Don’t let the stage names fool you either. The real names of these musicians is no secret (Niklas Isfeldt, Markus Fristedt, Fredrik Nordstrom, Peter Stalfors & Patrick Jerksten), but they use stage names for Dream Evil to add a bit more fun to the overall vibe. And that’s what Dream Evil is–FUN. Detractors are never going to be sold on this band, so enough about them. Six is an album that all Dream Evil fans should love, and if you’ve never heard Dream Evil but enjoy bands like Iron Maiden, Judas Priest & Dio, you’ll probably like them. Six is not as good as Evilized or The Book of Heavy Metal, but it’s an improvement over United and In the Night, I think. I missed out on 2006’s United album which I had read some mixed reviews on, but now I’m back on board for In The Night, which was a much anticipated release for me in 2010. Despite the change in membership since 2004’s The Book of Heavy Metal (which I haven’t reviewed yet because all I have is the bonus DVD, I lost the CD a few years ago), such as Gus G leaving to go full-time with Firewind and Snowy Shaw leaving to do a variety of projects, the band’s power metal sound remains the same as guitarist/producer/founder Fredrik “Ritchie Rainbow” Nordstorm holds the fort down. In fact, the only noticeable change to the band is that all the members now have stage names, which is a bit odd to do eight years and six albums into your career, but oh well. Humorously, on the band’s website and in the album credits, everyone is listed as playing “lead” on their respective instruments. There’s also some pretty funny band photos in the booklet as well. Lyrically, these guys are purposefully not breaking new ground. But how could you not like a song called “Kill, Burn, Be Evil”? How cool is that? There’s a lot of talk about “metal” that would fit right in on a Manowar release, but then that’s part of the fun isn’t it? There’s even a funny line in “The Ballad” name-checking Snowy Shaw. It doesn’t make a ton of sense, but it sure does work well when Nick Night screams it with such passion. Truly a gifted “metal star” vocalist! 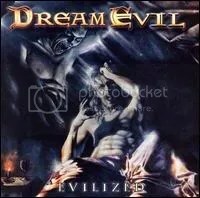 As for the music, Dream Evil does a great job of coming up with catchy choruses and keeps the filler to a minimum. They’re easily one of the best metal bands to come out in the last decade and it’s a shame they don’t get enough recognition. In short, if you liked their previous albums, you’ll like this one as well. This album is on par with Evilized and The Book of Heavy Metal, in my opinion, and is a definite highlight release for 2010. 80s-influenced power metal from Sweden! 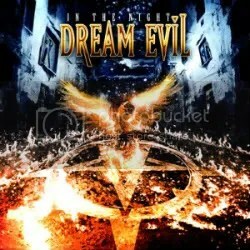 I first became aware of Dream Evil in 2004 and immediately fell in love with them. I must’ve downloaded sampled their songs somewhere, because I remember ordering Evilized and that year’sThe Book of Heavy Metal at the same time. This is just a great album all around: full of catchy choruses, proclamations of love for metal, some nice power ballads and great guitar work. And I have to point of the soaring vocals of Niklas Isfeldt. The guy is probably one of my favorite metal singers. “Bad Dreams” sounds like a lost Dio song, but what do you expect from a band that shares their name with a Dio album? “Forevermore” is a pretty beautiful ballad and even I haven’t heard the album for awhile, I find it popping it in my head every now and then.